Infogrid Pacific is a Singapore based company, with offices in Pune (India), London (UK), and Auckland (NZ). Infogrid Pacific was founded in 2005 by Richard Pipe, Deepak Chandran, Duming D'Souza and Joseph Yeo in order to develop and sell new generation Web Services based content management and digital publishing technology and solutions. Richard Pipe along with the core team were among those who founded the Indian development facility of the innovative publisher solutions provider Versaware. This Indian development group, Versaware (India) Pvt. Ltd. was the production and technology development operation for early e-book mover and shaker Versaware Inc. (Delaware). Notable was the deal to digitize the entire backlist of UK publisher Taylor and Francis. Versaware Inc. went into liquidation in 2002, and Versaware India survived through a voluntary liquidation. and continued to grow after a reorganization to DX Technologies Pvt. Ltd. with a solid order book, substantially ongoing work with Tayor and Francis and other large academic publishers. It was sold in 2002/3 to Singapore based Isoftel (later renamed 1st Software Corp. Ltd). In 2005 Infogrid Pacific released IGP:ECMS Solutions, which was quickly followed by a significant set of product updates in 2006. The application is a suite of Service Oriented (SOA) solutions built on an Open Source framework and designed to provide a high quality, affordable, content management solution, to the SME/SMB market, particularly within developing countries. In March 2007 Infogrid Pacific capitalized on the early experience in e-book development and moved aggressively into developing multi-format Online digital XHTML authoring systems with a special product release named IGP:PublisherECMS. This is optimized for complete content life-cycle management through extension service modules. It included the first version of IGP:Digital Publisher which had tools for content authoring and editing, plus instant generation of output formats for print PDF using Prince_XML as the prime rendering engine, e-books - (EPUB, Mobipocket, Web applications plus special packaging for CD-ROM/DVD release and SCORM learning objects. To execute this the application uses IGP:FoundationXHTML. This uses a controlled set of combinable XHTML5 tagging patterns rather than XML DTD or XML Schema controls building on the fact that HTML5 is no longer based on SGML. In December 2008 Infogrid Pacific released AZARDI, an ePub format Reader with built-in file editing functions to allow non-DRM'ed files to be opened, edited and correctly repackaged. AZARDI Cloud Reader was released on the 10th March 2012. It matches the features of the desktop version. The cloud reader makes digital content in ePub formats available in any standards compatible browser and device. AZARDI Cloud Reader includes the AZARDI Interactive Engine and fixed layout capabilities. It supports SMIL Audio overlays and has an interface that can be customized for any viewport or screen size. The AZARDI 17 Desktop Reader was released on 31 December 2012 with full support for the IDPF Fixed Layout specification, but adds new features such as sliding fixed-layout viewports, asymmetrical page layouts, plus horizontal and vertical page spreads. AZARDI 23 was released on 20 August 2013 with support for the experimental EBook Zero (E0) format. 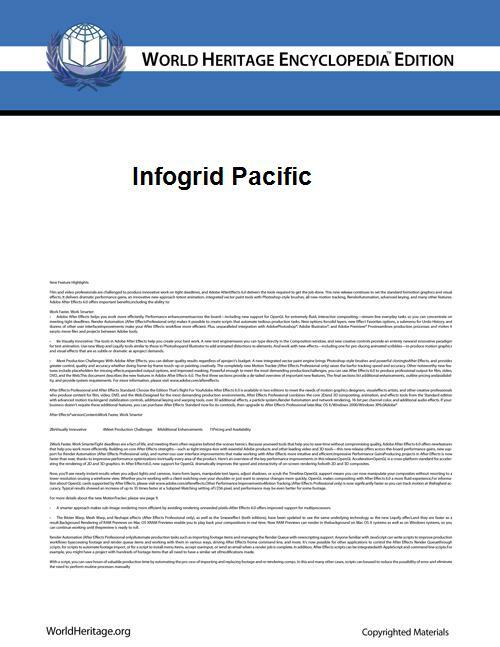 Infogrid Pacific maintains a number of digital content documents and books for publishers and developers for evaluating and testing the advanced use of the ePub 3 format features such as all-language support, MathML, SVG, SMIL and embedded fonts in WOFF format with ePub 3 Open Container Format defined font obfuscation. The evaluation books have been increased to include demonstration and test books supporting the IDPF fixed layout format. As of September 2013 Infogrid Pacific has approximately 190 employees, 40 in core application development and support, 150 in specialist digital production services, with director level sales operations in Auckland, London, Singapore and Pune. Infogrid Pacific license their applications directly to end-users and with an Online SaaS business model.